After a 64 year break, Tennis returned to the Olympics in 1988 as a medal sport (returned in 1984 as a ‘demonstration sport’) and the list of female singles winners makes for some impressive reading. The likes of Steffi Graf, Venus Williams and Justine Henin have won since the sport’s revival in the Olympics and only 2008 winner Elena Dementieva is not a multiple grand slam winner. The new World No.1 Victoria Azarenka should have no issues on her way to making the quarter final, facing first Irina-Camelia Begu. The Romanian is far more comfortable on clay and has very little experience on the grass, most recently exiting Wimbledon in the 1st round and throwing away a 6-0 lead in a final set tie break against Francesca Schiavone in their match in S’hertogenbosch. A second round tie will be with another clay courter, be it Maria Jose Martinez Sanchez or the in-form Polona Hercog who took the title in Bastad last week. Potential third round opponents Jie Zheng or Nadia Petrova both have had impressive runs at Wimbledon in the past and have decent grass court credentials – Zheng pushing eventual winner Serena Williams at Wimbledon this year to 3 sets stands out, along with her Semi Final appearance a while back. Petrova took the S’hertogenbosch title this year but appeared to be carrying an injury in her defeat to Dominika Cibulkova in Carlsbad last week. Perhaps the most appealing seeded player to draw for the unseeded is Sara Errani, the French Open finalist is far less comfortable on the grass and even suffered the humiliation of the golden set in her defeat to Yaroslava Shvedova last month. Errani has drawn five-time Wimbledon champion Venus Williams. Although she was incredibly disappointing at Wimbledon this year, winning only four games against Elena Vesnina, I don’t think you can write her off completely. She may feel her medal chances are much better in the doubles with sister Serena where they are favourites for the gold medal. Timea Babos has shown great potential this year, winning the title in Monterrey and earning a surprise victory over Birmingham champion Melanie Oudin. Angelique Kerber should be the favourite to come through the other side of this quarter, and potentially has the chance to exert revenge over Errani who defeated her in the French Open. She faces Petra Cetkovska in the first round. Serena Williams will be very happy with her section of the draw. The Wimbledon champion is on an 11-match winning streak after taking the title in Stanford. She looked ominous at Wimbledon and her serve is one of the best of all time, meaning that she is almost unbreakable if it is working. Her first round tie will be a battle of the former World No.1’s as she takes on Jelena Jankovic. The Serb has been on a very bad run of form of late with a string of first round exits to her name, although she did make the final in Birmingham (though perhaps more due to a favourable draw). Jankovic appears to be lacking motivation at times but if there is an opponent that can inspire her to play well, it has to be Serena. Young hopefuls Mona Barthel and Urszula Radwanska will battle for the presumed second round match-up with Serena, both can cause a lot of trouble but inconsistency is likely to be their downfall. Klara Zakapolova will be looking to improve on her 0-3 head to head against Francesca Schiavone, and was mostly recently defeated by the Italian this year at Wimbledon. 2010 Wimbledon finalist Vera Zvonareva still looks to be suffering slightly from a number of injuries but she has potential to be a surprise medalist if she can recover sufficiently. Serena’s potential quarter-final opponent could be Caroline Wozniacki, whom she has a 4-1 head to head record over. The Dane faces British hopeful Anne Keothavong first up – who was embarrassed by college star Mallory Burdette at Stanford a few weeks back. Many more eyes will be on Daniela Hantuchova, who is enjoying new found fame after posing for the ESPN Body Issue. The Slovakian has been disappointing in the middle part of this year, not helped by a foot injury that left her out for almost two months. She suffered a poor straight sets defeat to Jamie Hampton at Wimbledon this year and will have a big job on her hands here, facing Na Li. Li has not quite hit the heights of last year, but is still a very dangerous player on all surfaces. Tamira Paszek will be confident with her position in the draw here, possessing recent grass court wins over Hantuchova and more famously under the roof against Wozniacki this year. With victory here, Serena can equal her sisters gold medal haul of three. This quarter of the draw contains five former, or current top 5 players. While Samantha Stosur is notoriously poor on grass, she will be happy with her first round draw against a clay specialist in Carla Suarez Navarro who she beat fairly comfortable in Wimbledon this year. The second round is much more likely to be where she departs – Roberta Vinci can be a threat and only made the fourth round of Wimbledon while Kim Clijsters is still a class act even if recent form has been sketchy. The Belgian will want to finish off in style at her last visit to SW19 before she retires. She holds a 2-0 head to head over Vinci, but both are a long time ago so not much should be made of that. Agnes Szavay makes her return after a long time out with injury and has a winnable match against Great Britain’s Elena Baltacha, but her fitness is a huge question mark after so much time out. Ana Ivanovic is the other stand out name in this section, she takes on the highly rated Christina Mchale. This is a wide-open quarter where someone has the potential to make a name for themselves. Whoever takes the previous section is more than likely just waiting for a quarter final with Maria Sharapova. The Russian disappointed at Wimbledon, losing to Sabine Lisicki and has the chance for revenge here in the third round. A first round tie with a slumping Shahar Pe’er should pose no issues at all. Lefties Laura Robson and Lucie Safarova could trouble her in the second round but Sharapova should progress with little trouble. Yaroslava Shvedova could disturb the balance in this section here, two good Grand Slam runs have seen her ranking improve greatly over the past two months and she has begun to show the potential of a few years ago again. She takes on Simona Halep in an interesting first round tie for the chance to take on Lisicki, who should dispatch of youngster Ons Jabeur with ease. Although losing the most recent meeting, Sharapova has a 3-1 head to head over Lisicki including the previous two slam meetings between the pair – Australian Open 12, Wimbledon 11. Samantha Stosur is a three times semi-finalist at Eastbourne but has never got past the fourth round at Wimbledon. 2011 Wimbledon champion Petra Kvitova opens her account against Kateryna Bondarenko – the Ukrainian will have full attention on the Singles event now after he sister withdrew from the doubles but it is unlikely she can trouble the Czech here while Shuai Peng or Su-Wei Hsieh will ensure an Asian presence in the next round. Bulgarian grass specialist Tsvetana Pironkova is probably the biggest danger to Kvitova here, she excels on grass and is a former semi-finalist at Wimbledon – where she was defeated by Vera Zvonareva in 2010. She also reached the quarters in 2009, losing to potential opponent Kvitova. Pironkova takes on the in-from Dominika Cibulkova, who recently took the Carlsbad title. When talking about Agnieszka Radwanska, she is always accused of having the easy draws in tournaments and it is hard to argue with people on this showing. She faces an out-form Julia Gorges in the first round with a potential second round tie against either a very poor wildcard choice in Veronica Cepede Royg or an inferior version of herself in Varvara Lepchenko. A third round tie is likely to be against Maria Kirilenko. Radwanska has proved recently she can beat her, even if the weather conditions were not suitable the Pole’s playing style. Heather Watson was dispatched off with ease at Wimbledon while Silvia Soler-Espinosa and Mariana Duque Marino are both most at home on the clay and will pose little threat. South Americans Mariana Duque Marino and Veronica Cepede Royg have not won a main draw match on Grass courts between them. Mariano has one in Wimbledon qualifying 2008. Tsvetana Pironkova’s difference in results off and on a grass court are staggering – other than her Wimbledon QF and SF’s in 2009 and 2010, she has never made the 3rd round in a slam. Who are your medal predictions for the tourney? Who do you think can spring a surprise here? Feel free to leave your comments below! Ace of Baseline takes a look at high profile tennis relationships.. The relationship between former World No. 1’s Caroline Wozniacki and Rory Mcilroy is one of the most famous in the sporting world between two athletes that are at the top level of their sport. However, criticism has been fired at the pair with many feeling that the relationship is having a negative influence on their sporting performance. With this in mind I thought I’d take a look at other high profile tennis relationships to compare. Since becoming a couple, both have performed fairly poorly in their major events with Mcilroy failing to make the cut at his most recent Major while Caroline Wozniacki exiting Wimbledon in the first round after being overpowered by Tamira Paszek in an entertaining three set encounter. This defeat knocked her to No. 8 in the rankings. Wozniacki’s game has always concentrated on staying consistent and drawing errors as opposed to a more aggressive game that many believe she should play. Although often disappointing on the big stage, there is no doubt her style was key to her twelve titles and 67 weeks as World No. 1 from 2010 to early 2012. However, Wozniacki isn’t the only player to date/marry a similarly high profile athlete. Ana Ivanovic 18-month relationship in with golfer Adam Scott coincided with a trophyless period in 2009-2010 as Ivanovic dropped out of the top ten. Failure to defend big points at the Australian Open and French Open cost her, following up a final appearance and a win with fourth and third round performances respectively. Defeat to Vera Zvonareva at Indian Wells was as close as the Serb got to a title in this period. Ivanovic’s most recent successes lie in the Tournament of Champions and her form over the past three years seems to indicate that her 2007/2008 form was of a career year than representative of what was to come. She has floated around the top 20 in the year end rankings, with her serving issues still working strongly against her. New coach Nigel Sears appears to have made improvements in 2012 with more consistency in the slams, making the third round at all three so far. Previous to this, Ana also dated Fernando Verdasco for a short period in late 2008, mostly during the tennis off-season. Fresh from her split with fellow Russian tennis star Igor Andreev is Maria Kirilenko, the 25 year old is dating Alexander Ovechkin, captain of the Washington Capitals in the NHL. Ovechkin is one of the most famous male athletes in Russia, having represented them regularly at international level and at one stage there could be a case made that he was one of the top stars in the NHL alongside Sidney Crosby. While the beginning of many other relationships coincided with a drop in form for players, things have never been better for Kirilenko, reaching a career high ranking of No. 14 after making it to the quarter finals of Wimbledon, pushing Agnieszka Radwanska extremely close in an epic three set encounter. It is interesting to note the lack of high profile relationships involving the top level men, with Novak Djokovic, Andy Murray and Rafael Nadal all in long term relationships while Roger Federer married former tennis player Miraslava “Mirka” Vavrinec in 2009 with the couple now proud parents of twin girls. While there are many inter-sport relationships involving tennis stars, there are two couples of tennis players that were some of the very best in their time. Steffi Graf and Andre Agassi must be the most decorate couple in tennis; the pair possess over 150 titles between them, including 30 grand slams singles titles – Steffi with 22 and Andre with 8. While retirement was looming for Graf by the time the couple got together, Agassi added an additional four titles to add to his previously completed Career Slam before retiring in 2006. In 2005, Agassi even managed to break his own wife’s record at the Miami Masters, overtaking her record of five titles by earning his sixth with victory over Carlos Moya. The pair first met at the 1992 Wimbledon Champions’ Ball, where the now famous photograph of the pair was taken, with Agassi sporting his now infamous mullet. Kim Clijsters and Lleyton Hewitt had a four year relationship even getting engaged, before the pair split up in 2004. Affectionately dubbed by Australians “Aussie Kim”, the young Clijsters was slamless in this time while Hewitt became US Open and Wimbledon champion in ’01 and ’02 respectively with convincing finals victories. The pair also made the Mixed Doubles final in 2000 but were defeated in straight sets. After the split Kim went on to become a quadruple slam winner, however the majority of these were after her comeback from a 2007 retirement. Hewitt definitely suffered from the emergence of Roger Federer on the ATP Tour, losing to him seven times in a row at Grand Slams with the Swiss making the final every single time he had beat the Aussie. While Kim was slamless during this period, she did reach the No. 1 spot in the rankings as a 20 year-old in 2003 and there is no doubt that she matured as a player in this time picking up plenty of titles and the No. 1 spot in doubles. Other notable tennis relationships include Iveta Benesova and Jurgen Melzer. The pair teamed up both off and on the court, even earning themselves the Wimbledon Mixed Doubles title, with Benesova’s singles form improving for a short period of time. It seems Melzer is no stranger to the leading ladies on the tour having previously dating 2004 French Open champion Anastasia Myskina and also Nicole Vaidisova, the latter of which is now married to fellow Czech Radek Stepanek. Personally, I am sceptical of the idea that relationships are to blame for a loss of form. In the case of Wozniacki, I just feel that a lack of a plan B has hit her hard and relying on opponents errors can only get you so far. As seen even before Rory was on the scene, when a big hitter has been on their “A” game she has struggled and she cannot generate enough offense to fight back. She is young enough to come back and learn from it, so I think she can definitely re-enter the top 5 but to go any further much more progress is needed at the slams. Along with New Haven, where she is a four-times winner her most consistent performances come in the US Open with a semi final place or better each of the last three years so this could be just the thing to reignite her struggling year. Do you think that having a famous sporting partner can distract your performance? Feel free to post comments below! This is the WTA’s new advertising campaign, which you may have guessed is called Strong Is Beautiful. Along with this sensual slow mo of Victoria Azarenka, there are 37 other female tennis players who have been photographed looking glammed up to accompany further videos of high-profile names such as Serena Williams, Kim Clijsters and Ana Ivanovic. I wanted you to take a look yourself and make your own judgement before I tell you my thoughts. Firstly, I don’t really get it. What is it advertising exactly? I had to read the related article to fully understand what the impact this campaign was meant to be having and even then I was skeptical. Drawing upon athleticism and grace – a unique combination that has turned the stars of the WTA into the most recognizable and followed female athletes on the planet – the campaign places the personal stories, pressures and dreams of the players front of stage. The creative is designed to support the WTA’s efforts to establish a deeper engagement with fans around the world and to promote both the sport’s next generation of players along with current established names. To me that’s just a polite way of saying it’s a massive sexualisation of female athletes. Admittedly it has a good chance of working but is that really how they want to attract more fans? I’m all up for having Ivanovic tell me about how she’s come through war-torn Belgrade and made it big as well as how Clijsters deals with the issues surrounding her children as I find that to be more inspiring than sweaty athletes in low-cut outfits. If you pay attention to my blog then you may have noticed I have a soft spot for women’s tennis. As of yet I haven’t quite figured out why I prefer it to the ATP Tour but, believe it or not, it isn’t so I can perv on the competitors. In fairness, some of the clips try to fight for equality both sexually and racially. They’re fine and well done to them on that count. Also I understand to encourage young girls to pick up a racquet they’re trying to target them so having Serena Williams talk about clothes might do that. But it just doesn’t sit comfortably with me. I look at the message “Strong Is Beautiful”. That conveys girls can do and look how they want and feel good about themselves. Putting the players in fancy dresses and make-up is a bit contradictory. Judge for yourself though. All the images and videos are available on the WTA website. Please comment and tell me what you think; I’d love to know your thoughts. Introducing the next star to come out of Serbia – Bojana Jovanovski. Despite some dodgy questions a refreshing laid-back persona shines through. Calling your opponent at Wimbledon “Australian girl” when being interviewed by a Brisbane-based network probably wasn’t a great move but the way she answered the final question like Ernie is obviously the correct choice redeemed her greatly. Based on looks alone she already bears resemblance to both Jelena Jankovic and Ana Ivanovic – the two Serbians ahead of her in the rankings – whilst her victory against the former certainly shows she possesses their on-court talent too. As the youngest player in the top 100 of the WTA rankings (currently no. 55) she’s no doubt one to look out for. With a second round appearance at SW19 and this year’s Australian Open in the bag she is set to make the main draw at the French Open for the first time this May. The 19-year-old has a lot to live up to. Ivanovic won at Roland Garros in 2008 but since claiming the world number one spot after her third Grand Slam final and first victory she’s fallen outside the top 20 and has been even lower. 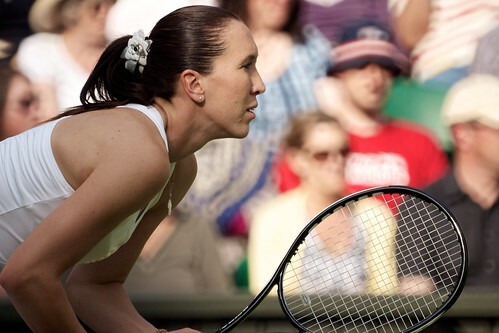 Jankovic was a semi-finalist that year and the only player to take a set off the eventual winner. However she has yet to win a major despite making the US Open final months after that defeat to Ivanovic. But if women’s tennis taught us anything last year it’s that anything is possible. Francesca Schiavone came from nowhere to beat fellow surprise finalist Sam Stosur in the French Open whilst Tsvetana Pironkova’s semi-final run at Wimbledon defied all previous form. Jovanovski has arguably more potential than both Schiavone and Pironkova with youth also on her side. Having yet to add a WTA title to her four ITF crowns the Serbian does have experience at Fed Cup level, performing strongly in straight set singles wins over Canadian’s Aleksandra Wozniak and Rebecca Marino. Jankovic should have won a Slam by now, Ivanovic should probably have won more and Jovanovski should prove this year that the Serbian production line still has plenty of juice left in it. Can Jovanovski reach the same heights as fellow Serbs Jelena Jankovic and Ana Ivanovic?